Earn $2.99 in Rewards credit. Click to learn more. Created for daily training and competition, GU’s New Energy Chews (also known as GU Chomps) pack energy-dense calories in a portable packet to help sustain the energy demands of long duration activities. 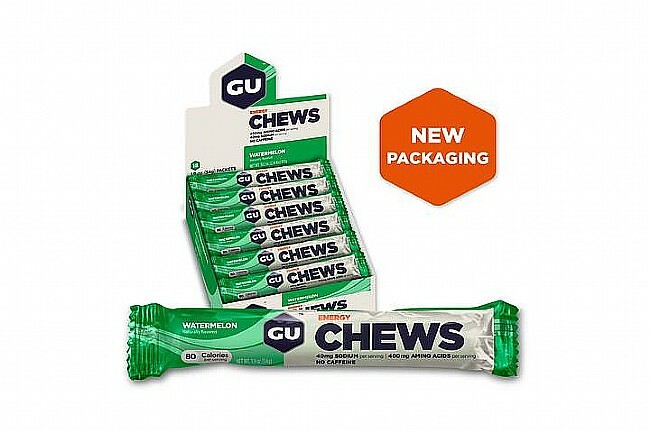 Energy Chews contain carbohydrates to keep you fueled and delay bonking by sparing your glycogen stores. Sodium, the primary electrolyte lost in sweat, aids in hydration by maintaining water balance. The branched-chain amino acids (leucine, valine, isoleucine) may reduce mental fatigue and decrease muscle damage.